Sunny days are finally here, and I couldn't be more thrilled. 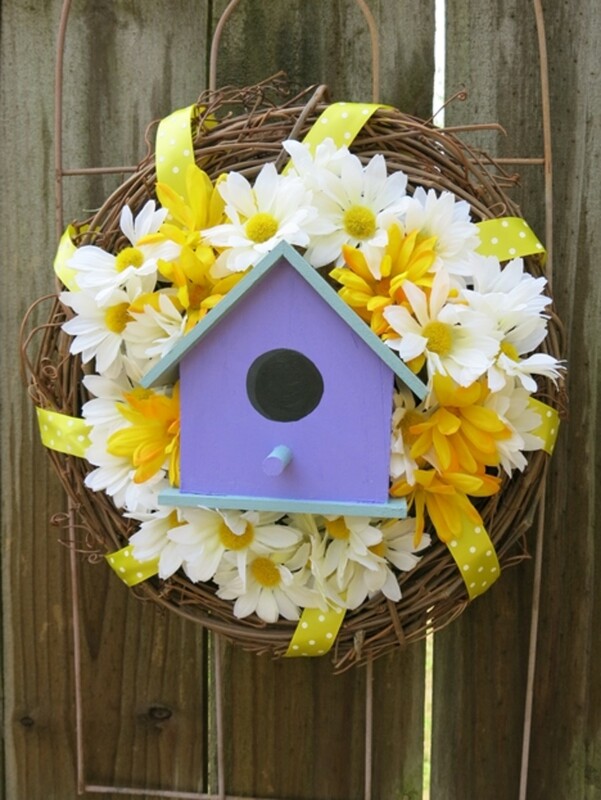 To celebrate, I decided to make a bright and cheerful wreath to welcome the warm days ahead. I came up with an easy plan to make my new wreath. I would tie strips of fabric around a wire wreath frame to make a fun display and then add some artificial flowers for a pop of color. 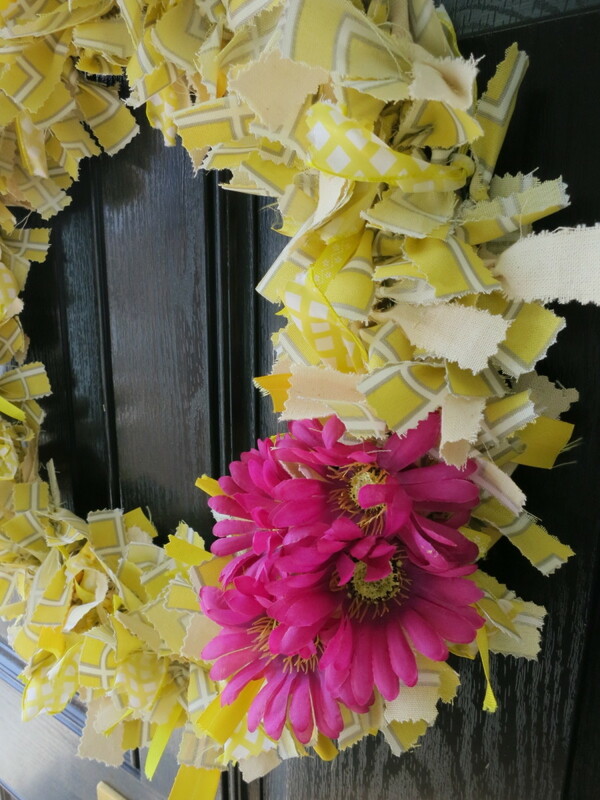 Although I made a Spring/Summer wreath, you could use the same technique and materials to make a wreath for any season or holiday. By changing the colors and fabric used in your wreath, you can create a special decoration that is unique welcome sign for your home. Show Support for Your School or Team - use just ribbons in the colors of your school or favorite team! The first thing I did was wrap my wreath frame in copper wire. 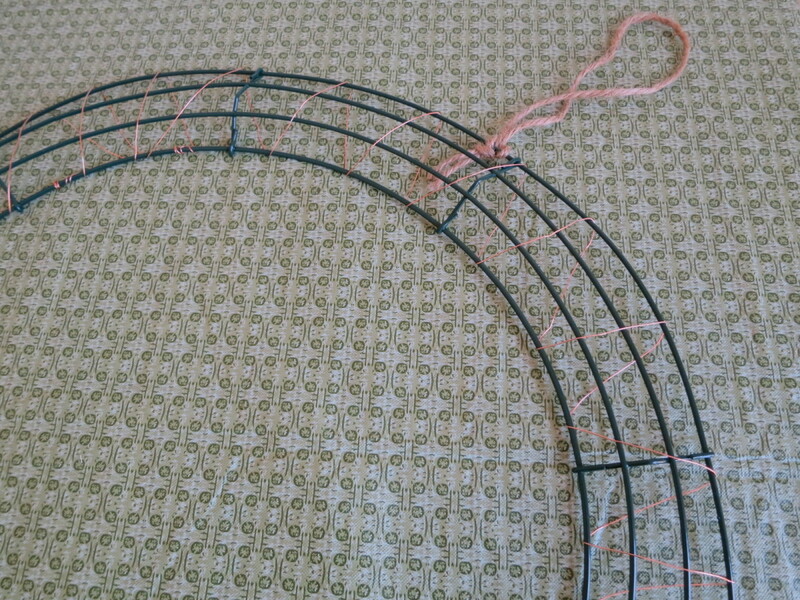 This created more spots on the wire frame for me to tie my fabric and fill in my wreath. At the same time, I used some twine to tie on a loop to use to hang my finished project. Next, I cut my main fabric (the yellow geometric) into strips that were about 1 inch wide by 7 inches long. I would suggest cutting one strip of fabric and tying it on your frame to see if you like the way it looks. If you want more length, you can cut the rest of your strips longer. I used pinking shears to cut my fabric to give the strips a decorative edge and to keep the fabric from fraying. There are now a lot of scissors and rotary cutters with fancy edges that would create a some pretty effects. The next step was just to start tying the strips of fabric on to my wire frame. I only tied them once, without really making a knot. I tied each strip tight and they seemed to stay in place. I moved around the frame as I tied on the fabric. Once I had a scattering of my main fabric around the wreath, I began to incorporate my various ribbons, which I also cut with pinking shears. When my wreath was about half full, I realized it was looking too yellow. I decided to add in some strips of artist's canvas I had. I like how this neutral toned down the bright colors and added another texture to my wreath. 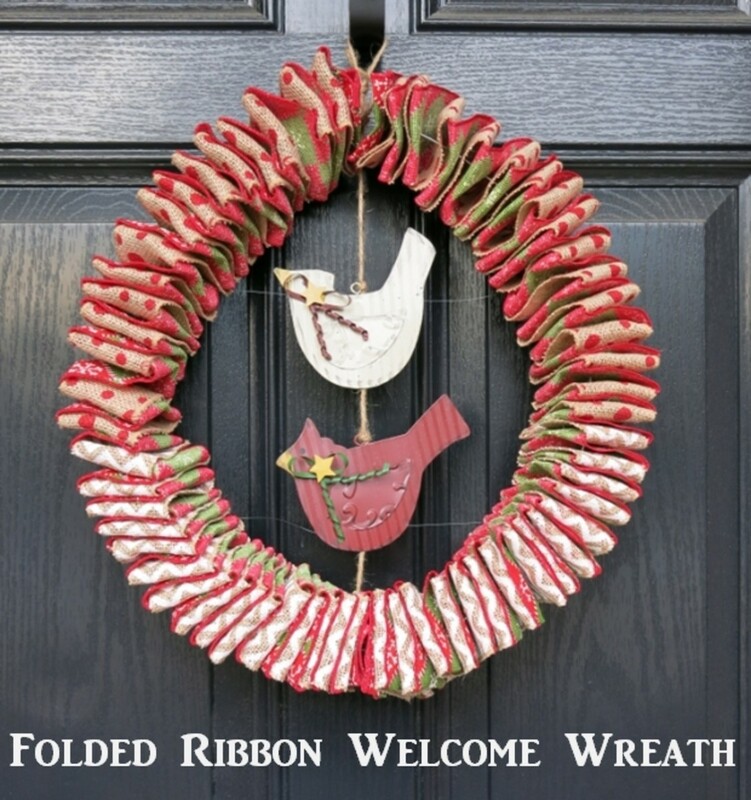 I continued to tie on my fabric strips and ribbon until my wreath frame was very full. I tried to not leave any of the wire base showing. 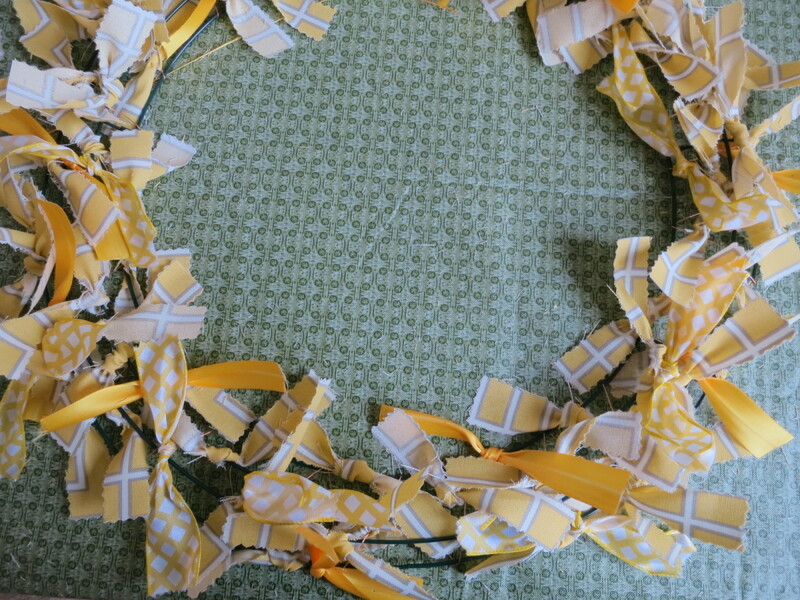 I added flowers to my wreath to create a bright sunny look, but you can use whatever decoration you choose. A big bow is always a nice finishing touch. For winter or holiday wreaths, you could add some Christmas balls or ornaments to complete your decoration. To add my flowers, I trimmed the stems so each was only about 2 inches long. I then wrapped more wire along the stem, poked it into my wreath and wired the flower in place. I was excited to put my new wreath on my door and I think it looks great. 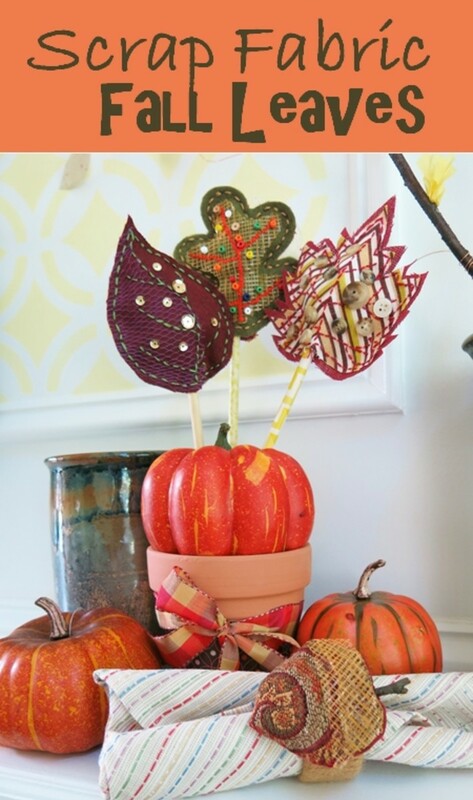 I hope my project has given you some ideas about decorating for your favorite season! 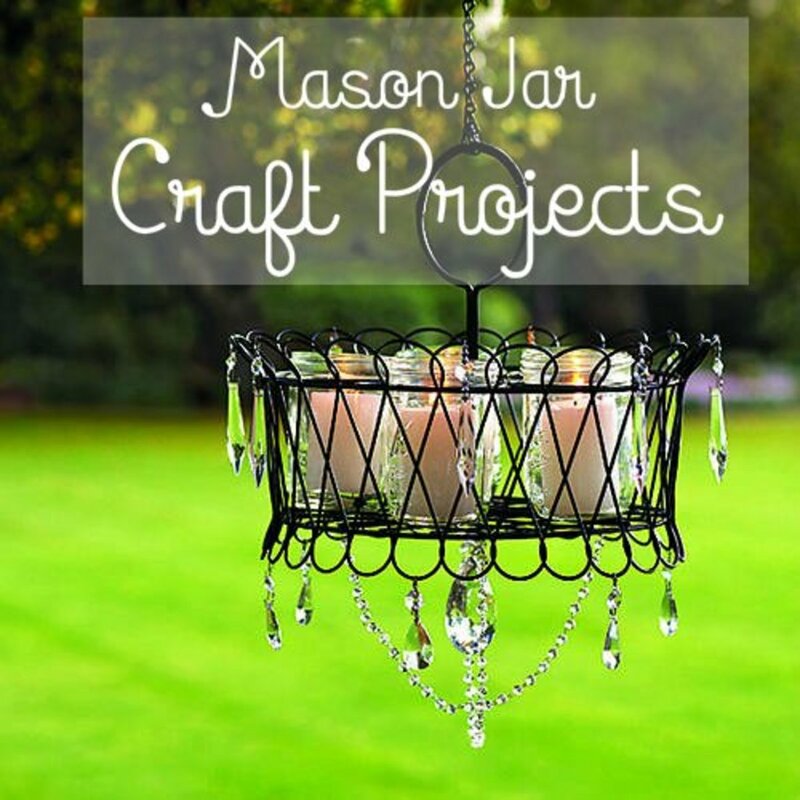 Looking for more craft and decorating ideas? Check out my other craft projects and tutorials! Hi Dolores! I'm so glad you like this wreath. 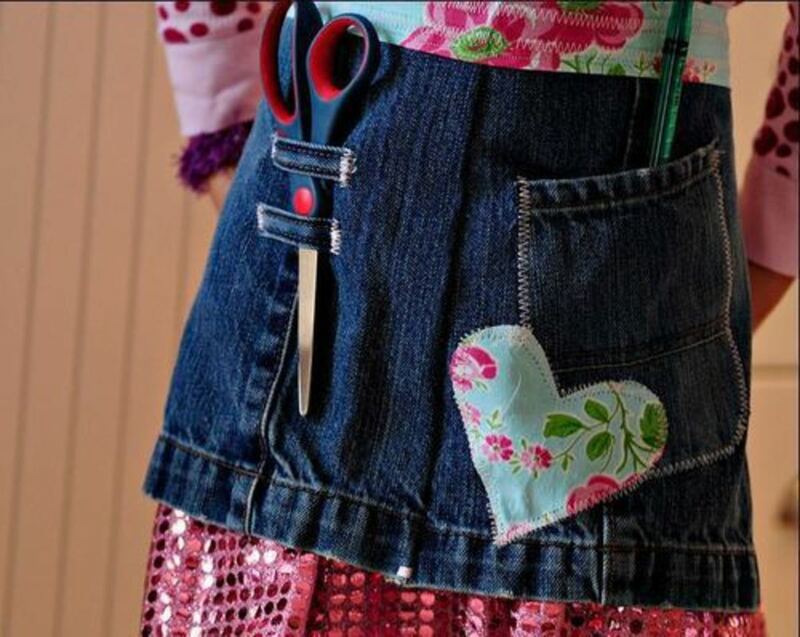 It's a great project for using leftover scraps of fabric. I hope you make something wonderful that you really love. Thanks so much for stopping by and commenting! This is so pretty! I love the cheerful yellow and white and can imagine how many different effects you could get with various color combinations. I have a ton of scrap fabric so this would be right up my ally. Thanks, RTalloni! 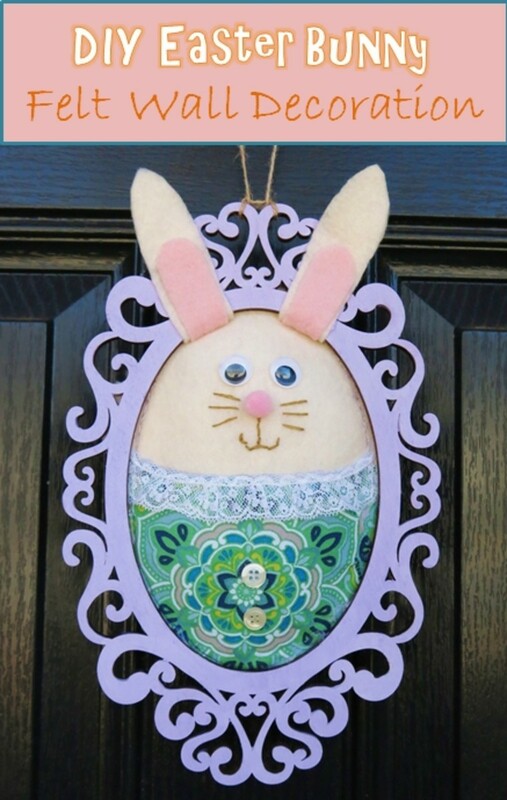 I must admit, it puts a smile on my face every Spring when this wreath goes back up on the door. Thanks, as always, for your comments! 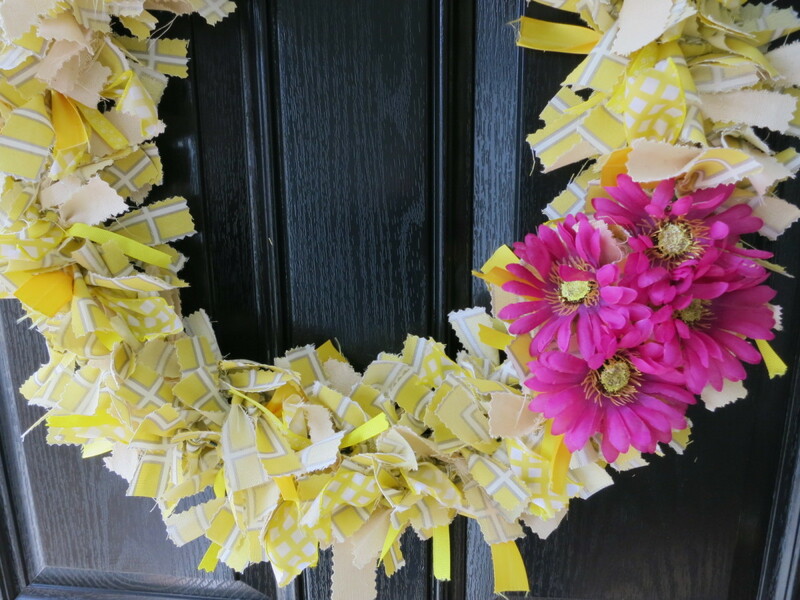 Your example of this wreath is so bright and sunny, perfect for summer. I love the bold yellow with the hot pink! Thanks for the tutorial. Cute! You always have such neat ideas. Happy New Year! I'm excited to hear and see what you make! Please stop back and share your finished wreath!! I know!! And I have tons of fabric around the house. I can't wait to get started! Thanks, VVanNess! I'm glad you like it. It's a very easy design that can be changed to match your style, holiday décor, or the materials you have at hand. Thanks for stopping by and commenting!! Beautiful wreath! I've been looking for a new wreath idea for a while. I tried that link, but I received a 'page does not exist' error message! She did a great job using my tutorial and her fabric scraps to make a really beautiful wreath!! So creative! 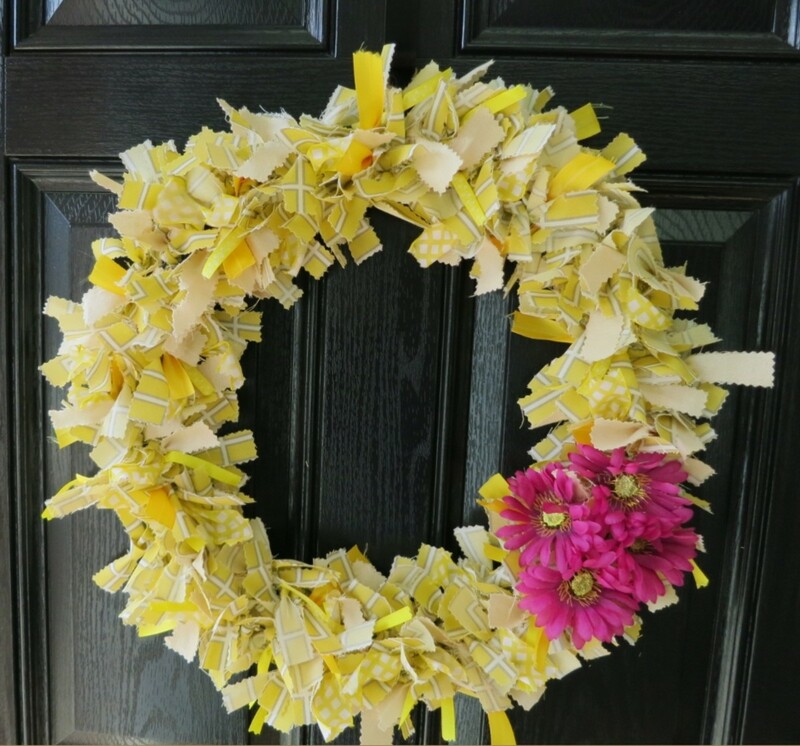 Hi Allison - I'm glad my wreath project has inspired you :) I hope you try it and make something that you love! Thanks for stopping by and commenting!! Thank you for sharing! I like the ideas you listed for different seasons or occasions. Can't wait to try it! HI purl3agony! This is really very useful as sometimes we run short of ideas to welcome someone in an innovative way. She did a great job and I love to see different interpretations of this project. I hope it inspires you too :) Thanks for stopping by and commenting!! I'm a day late, but this would have been a neat project for the Fourth of July with red, white, and blue. Hi shooterupton - Oh, you know, just sitting on the couch... :) Glad you like it. Thanks for your comments! Hi Jeannieinabottle (great name!!) - I'm happy to share :) I think there are many ways to make a similar style of wreath, but this seemed the easiest and most obvious. And it still looks great after hanging for a few months. So glad you like it! Thanks!! I've always wondered how to make a wreath like this. My neighbor has one and I was kind of jealous. :-) Thanks for sharing this great idea. Hi Dolores - It didn't take that long to tie on the strips. However, cutting all the strips was a pain in the neck :) It was worth it though!! Thanks for stopping by and commenting! What a good idea to use up scraps. This is just adorable! What a clever idea! And the colors look so pretty against the door. While I imagine that it takes awhile to tie on all those pieces of fabric, I think it may be very soothing! 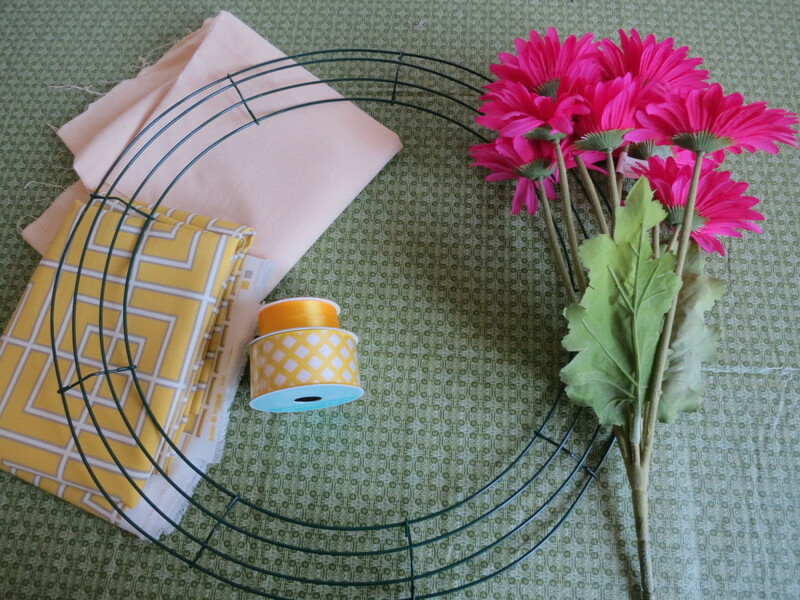 I want to make a fabric wreath! Thanks for writing this hub. Voted "up" and "beautiful". Hi Austinstar - I agree! 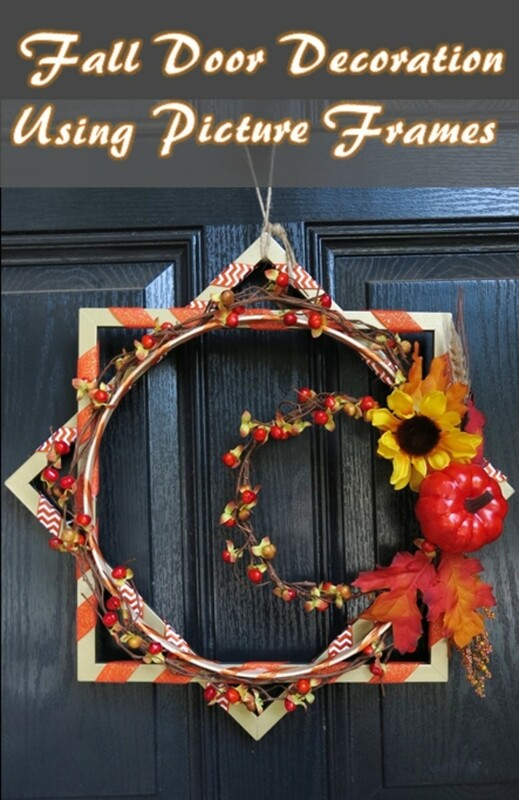 I'm trying to make some type of door decoration for each season or holiday as they approach. Thanks for your comments! Very pretty! I love hanging wreaths on the front door. It just feels homey. Easy decorations for holidays. Hi Unlearner - Thanks!! It's a pretty easy project and I'm very happy with the results. Good luck with your wreath! I have always wanted to make one of these, perhaps I should really make the effort this year. I love the colour combination. Well done, on another beautiful article. Hi anglnwu - Thanks for stopping by and being so sweet to comment. I appreciate it! This is very cute and definitely an eye-catcher. I could definitely use a bright wreath like yours. Thanks for sharing. What a great idea and as a quilter I have tons of fabric. I can already see a 4th of July wreath in my future. Pinned and shared. Hi kidscrafts - Thanks!! Now if the warm weather would only find its way to my door :) I want to wear sandals again!! Hope you have a great day! Beautiful wreath! 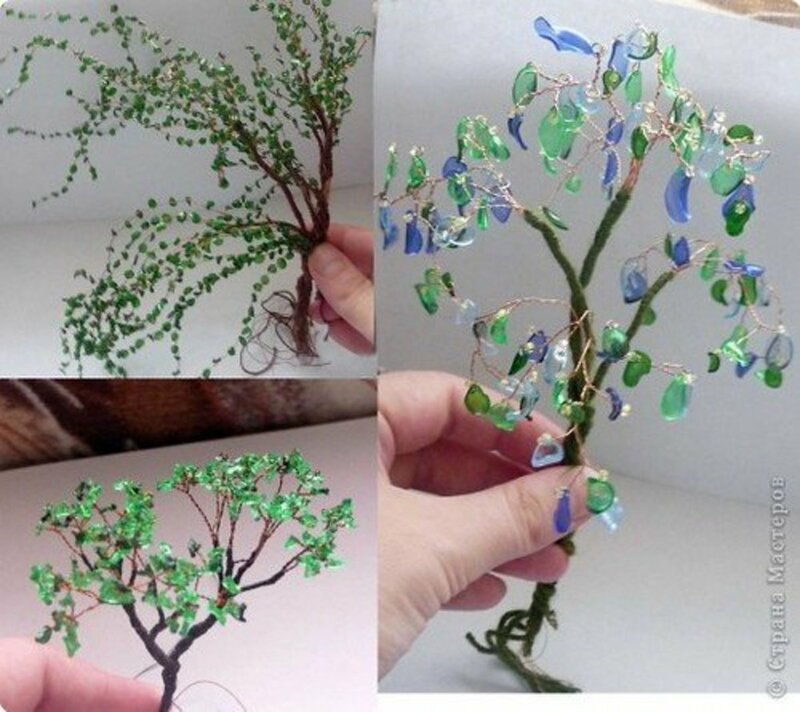 Very creative and you are totally ready for Spring! It really goes well on your door! Hi pstraubie48 - Thanks for your comments! I'm sorry to hear the moths made a meal of your rug :), but I'm sure your daughter will make a beautiful wreath! I hope you love it. Have a great day! These are so cool. My daughter has told me she will make one for me. She has made me several amazing wreaths over the years. In college years ago, I made a rug using this approach of course without the frame but using the scrap fabric. Sadly the moths found it tasty and I no longer have it. Hi VivaLaVina - Thanks for your comments! I 'm very happy with the finished wreath, and it's easy to make. Thanks for stopping by! That is a one beautiful wreath!